For smaller aquariums one heater works well, but for larger systems the use of multiple units is advised. With stick-on, floating, multi-function remote digital sensor, and many other types of units to pick from, the material a thermometer is made of is an important factor when choosing one as well. This category includes having items on hand such as a various sized plastic buckets or containers, tank cleaning tools such as a siphon tube/hose, an algae scaper or magnet, as well as nets of different sizes, spare equipment replacements parts, and so on. A good way to keep track of what maintenance tasks you have preformed and when is to keep a log book or record of everything you do. Once you have decided where you are going to place your new aquarium, you will need to choose a tank that will fit the available space. Fortunately, there will probably be a number of different tank sizes and styles that will work for you. While you are shopping for your new tank, keep an eye on what equipment (filtration, lighting, etc.) is included. Buying an aquarium package or "kit" can save you a lot of time and money as everything included is designed to fit the tank. For smaller spaces, the Plug n' Play Mini/Nano Aquarium Kits are a quick way to get almost everything you will need to get started. For larger spaces, one of the Top 1-50 Gallon Aquariums might work for you. If you have the space and desire, one of the Showsize Display Aquariums might be just the ticket. For those who want to design your own tank and save money at the same time, you might want to explore the DIY Aquariums route. Building your own aquarium is remarkably easy to do. While you are shopping for your new aquarium, keep in mind that you will need something to put it on/in. Many of the packages include an aquarium stand, if not, there are a number of manufactured Aquarium Stands and Cabinets to choose from. Again, if you like building things and save money, one of the DIY Cabinet & Stand projects might work well for you. The type of lighting you choose will be based on the type of system you have planned to set up, as well as what kind of livestock you will be keeping in it. If you are not purchasing an aquarium kit or package you will have to select your tank lighting. Fish-Only Tank Lighting is less expensive while Reef Tank Lighting and Coral Lighting are a bit more involved and pricey. While shopping for lighting, keep in mind that you may want to upgrade your tank from a Fish Only to a reef tank in the future. Buying fixtures which can be retrofitted with more powerful bulbs in the future might be a better buy in the long run. The lighting products found in Top Power Compact Fluorescent Light Fixtures, Top Fluorescent Aquarium Light Hoods and Top 5 Top Metal Halide Fixtures will give you an idea of what is currently available on the market. If you are interested in a long (and even short) term money saver, look into the LED Light Fixtures. These sleek, compact and efficient fixtures are now available with reef grade bulbs. You will also find that using a Power Center to control your lights and other electrical equipment will greatly simplify running your new aquarium. If you have not purchased an aquarium kit (package), the type of system you are going to set up will help you determine which kind of filters and filtration system to choose. Choosing a Filtration System is the next step in putting your new aquarium together. Canister Filters can be used with almost any type of system. Wet/Dry Trickle Filters have the advantage of being modified to meet almost any demand. Power Filters are usually hung on the tank are easy to use. Protein skimmers remove Dissolved Organic Compounds (DOC's) directly from the aquarium system water, before they are processed by the biological filter. While not essential to an aquarium filtration system, many people find that skimmers do take a lot of the load from the biological filter, allowing a larger fish and invertebrate population in the tank. What protein skimming is, and how it works will help you understand their function. Depending on the size of your aquarium, the use one or several powerheads is an excellent way to provide good water circulation throughout the system. Since the substrate is more than just the "stuff at the bottom of the tank", Choosing the Right Substrate for your aquarium is important. 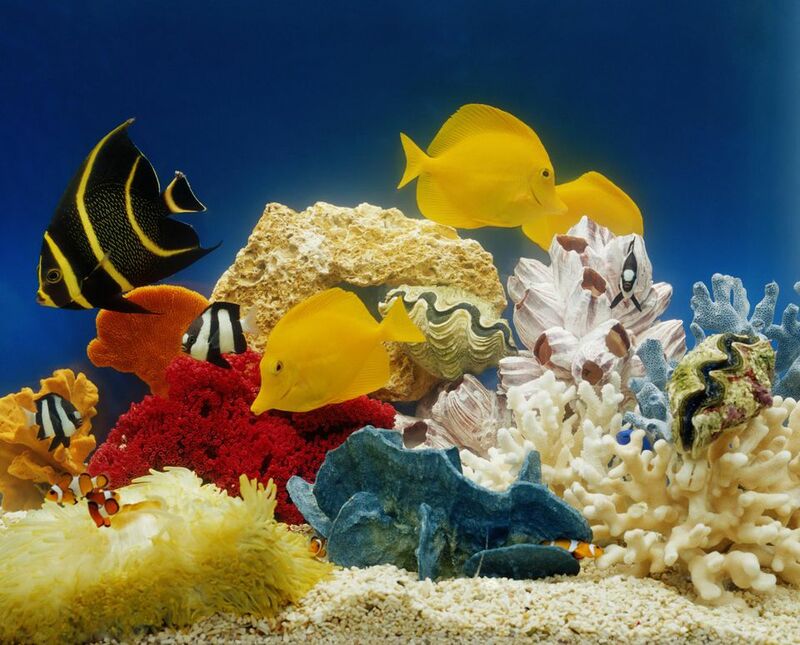 There are a number of different colors, types, densities and sizes of materials used for aquarium substrates. If you will be having a lot of water current in your tank, you will want a heavier substrate to keep it in place. If your substrate will be a significant part of the biological filter, porosity and surface area will be important. If you choose to use a Jaubert/Plenum Filter, you will want to use a Live Sand that is suitable for a Deep Sand Bed. To help you see what is available on the market and compare prices, here are some of the Top Saltwater Aquarium Sands & Substrates. Live Rock plays an important role in a marine tank. Many marine animals, fish in particular, can be quite territorial. It is important to provide ample shelter or places where the animals can hide, sleep, and avoid potential problems with aggression from other ​tankmates in the confined space of an aquarium. While a vast majority of marine aquariums utilize Live Rock, understanding the answers to the questions: What is Live Rock & Its Purpose? before you invest in Live Rock can save you a lot of money. Which Brand is the Best to Buy? Also referred to as a salinity tester, this item measures the specific gravity or salt content of the water. Compare Prices on the Top Hydrometers and Refractometers. For smaller aquariums, one heater works well, but for larger systems, the use of multiple units is advised. With stick-on, floating, multi-function remote digital sensor and many other types of units to pick from, the material a thermometer is made of is an important factor when choosing one as well. For smaller aquariums, one heater works well, but for larger systems, the use of multiple units is advised. With stick-on, floating, multi-function remote digital sensor, and many other types of units to pick from, the material a thermometer is made of is an important factor when choosing one as well. Top Saltwater Aquarium Test Kits. Which Tests Should be Performed, and When? Since air bubbles in saltwater aquariums will cause salt creep, air pumps and air stones are normally only needed if you are going to run a piece of equipment that requires these items, such as a counter-current protein skimmer. This category includes having items on hand such as a various sized plastic buckets or containers, tank cleaning tools such as a siphon tube/hose, an algae scraper or magnet, as well as nets of different sizes, spare equipment replacements parts, and so on. A good way to keep track of what maintenance tasks you have preformed and when is to keep a log book or record of everything you do.